There goes a total of 8 months without a single sketch, not even a doodle on tissue paper while waiting for my drink, seriously. I don't know why I was too lazy to lift a pen for the last 8 months considering I wasn't that busy actually. I really need to discipline myself for this post of sketching series to work *sigh. 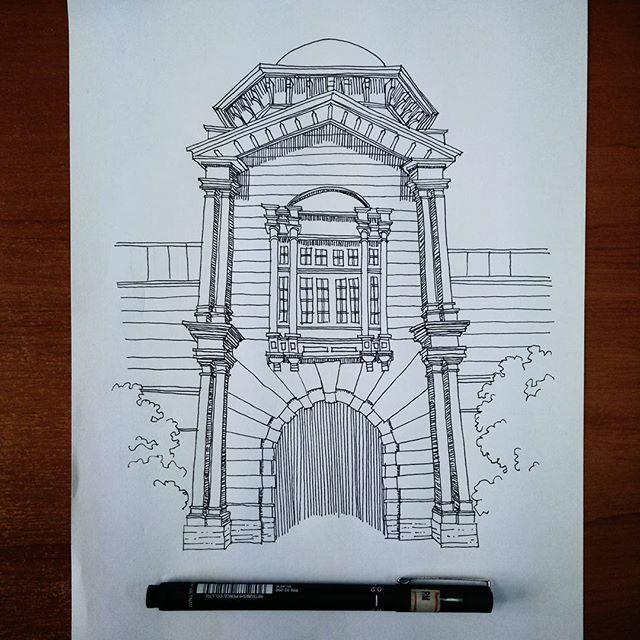 Anyway, while I was bored at the office yesterday, I managed to draw the main entrance of KTM Ipoh. I was thinking to draw the whole building but obviously, I was too lazy to do so. I think this one is okay enough for a start after a long break from sketching. I'll draw the whole building when I'm in the mood and I'll write about the building in that post instead. Thought I would end my blog post by the previous post (My Journey | 2017) but somehow I think I must post this drawing 'cause I won't draw anything if I were to post this one next month. So yea, I hope my awkward, rough sketch is good enough to please your eyes and happy upcoming new year! KTM KL lagi cantik kan. But both are nice dia punya seni.